New Starbucks on Main Street! What to expect and on-scene photos! Disney’s California adventure already has a Starbucks. 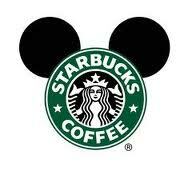 Beginning this Tuesday – we will officially be able to enjoy Starbucks here at Walt Disney World! There have been some soft openings this week and as usual – our man-on-the-scene reporter Ramon Rodriguez was there to get you some photos! All drinks are offered under the Disney Dining Plan as a SNACK CREDIT!! Yahoo!! The bakery will be staffed by Disney Cast Members – not Starbucks employees. Starbucks items will be sold until 11am. 11am and later, we can get both Starbucks and Disney treats. This will include cupcakes, cookies and brownies. The cinnamon rolls are not available at this time, but take heart, they will continue to be offered at Gaston’s Tavern in the New Fantasyland. Unfortunately, there is no longer any indoor seating at the bakery, but at least there will be more room to stand inside. The full Starbucks drink menu is on offer, beginning at park opening each day. There is a photo above but here is a link to the official menu from Starbucks in case you want to see more details. There are four hot breakfast options until 11am. Three are sandwiches and one is a vegetarian wrap. There are also grab and go cold sandwiches available. You CAN use your Starbucks gift cards and mobile apps for purchases. The cups are branded with both Disney and Starbucks artwork – see photo above. It is not possible to redeem My Starbucks Rewards, but your purchases do earn you My Starbucks Rewards. Exciting stuff right?! It is so exciting to know we will have this convenient and delicious new option for our cup of joe in the Magic Kingdom. ← How to get a Princess Makeover when the Bibbidi Bobbidi Boutique is fully booked! I understood when I first heard of this that the only thing changing was the Starbucks coffee. There would still be indoor seating and they would still offer all of our favorite baked goods including the decadent cinnamon rolls. One of my favorite thing about my early morning stroll down main street was stopping at the bakery for coffee and a couple of pastries. One of the best smells in the park early in the morning. A bakery still had that Mainstreet Bakery feel, I love a good Starbucks coffee but I can get one everyday when I am at home. I hope this doesnt offend anyone. Just my opinion.